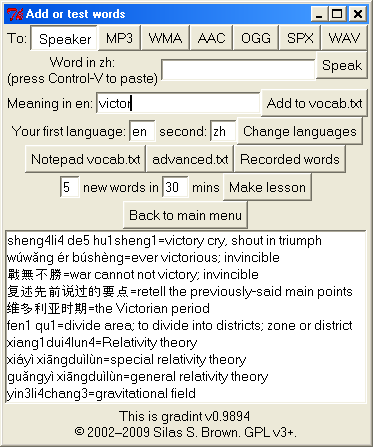 Gradint is a program that can be used to make your own self-study audio tapes for learning foreign-language vocabulary. You can use it to help with a course, to prepare for speaking assignments, or just to keep track of the vocabulary you come across. The method: Gradint uses a variant of the "graduated-interval recall" method published by Pimsleur in 1967. It's like audio flashcards that appear in a special pattern designed to help you remember. The Pimsleur accelerated language courses use several techniques (they say some are patented), and Gradint does not imitate all that, but this particular 1967 idea is now in the public domain so Gradint can use it to help you learn your own choice of vocabulary. Technical graph of a lesson with many graduated-interval sequences. The shorter ones do background revision of older words; pink ones do the newest words; springs show degrees of flexibility. Gradint gives only audio, so you concentrate on pronunciation. (And so you can listen during daily routines e.g. washing etc, since you don't have to look or press buttons during a lesson.) Gradint can write its lessons to MP3 or similar files for you to hear later, or it can play them itself and try to adapt to emergency interruptions. The words it uses can be taken from real sound recordings or they can be synthesized by computer. You can add words to your collection at any time, and Gradint can manage collections of thousands of words (and supports batch entry). It can also help you rehearse longer texts such as poems. Gradint is free software (as in "open source"), distributed under the GNU General Public License (GPL v3). The latest release is v0.99899. If you are learning Chinese, you might also want Yali Cheng's Mandarin voice (hear a sample) or a lower-pitch version of Yali's voice or Cameron Wong's Cantonese voice. These are larger downloads but less "robotic" than the voice that comes with Gradint. On Windows just open them; on other systems put them in the same folder as you put Gradint. On Windows 7+ click the small "More options" link to reveal the "Run anyway" option (I haven't paid Microsoft to be a "known publisher"). Don't worry about the background gradint-wrapper.exe. For Mac OS X, download the Mac version, unpack it, and open Gradint. For Linux and other Unix systems (including OLPC laptops, NAS devices and the Raspberry Pi), download the Linux version, do tar -jxf gradint.bgz and run using gradint/gradint.py. Also install espeak and python-tk packages if possible. For Nokia/Symbian S60 phones, install PyS60 and ScriptShell (those links are for 3rd edition phones; for other editions google it), unpack gradint-S60.zip into the phone's data\python or python folder, open Python and run script gradint.py (I also have some Python utilities for S60 phones by the way). For RISC OS, download RISC OS Python and gradint.zip; shift-click to open !gradint or click to run. Alternatively, use Gradint Web edition with any browser. You can set up your own server with the Unix version (above) and the server scripts (also includes scripts for email-based service). Tell the program which language you want to learn. On most systems, Gradint will show a GUI which lets you do this. A more technical way to do it is to edit the file settings.txt. If possible, prepare some audio prompts such as "say again" and "do you remember how to say". These can be real recordings or synthesized text. Some text for English and Chinese is already provided, but if you won't be using a speech synthesizer you can download sampled English prompts. For any other language you should ideally add your own; for details of how to do this, see the file README.txt in the prompts subdirectory of the samples directory. You should then be able to run the program every time you want a lesson. You can do more advanced things if you are able to edit configuration files. For details see the file advanced.txt (that link is for reference only; to make changes you will need to open the copy in your gradint installation). A separate program charlearn can help you learn to recognise foreign characters. If you are learning Chinese, be careful of commercial computer voices. All material © Silas S. Brown unless otherwise stated. GitHub is a trademark of GitHub Inc.
MP3 is a trademark that was registered in Europe to Hypermedia GmbH Webcasting but I was unable to confirm its current holder. Pimsleur is a registered trademark of Beverly Pimsleur exclusively licensed to Simon & Schuster. RISC OS is a trademark of Pace Micro Technology Plc. Any other trademarks I mentioned without realising are trademarks of their respective holders.